Medford has done several projects for us including Crosstown, Children’s Museum, Visible Music College, and Graceland West among many others. Meghan is always very conscientious and customer service oriented. The quality of Medford’s roofing installations are top notch, and they stand behind their work. If something is found that needs correcting, they will always address it even if it costs them money to do so to ensure the proper results for the project. We consider them one of our top subcontractor partners and think highly of their abilities. Brett Grinder LEED AP | Vice President | Grinder, Taber & Grinder, Inc. The price was competitive, they showed up on schedule, the job was completed on time, and the workmanship was top notch. Gregg R. Overman Owner, The River City Soap Co. This year, hail damaged the roofs of all our buildings, twenty-nine buildings total. Fortunately, insurance covered the cost of the repairs. As required, repairs of this size and cost were subject to the bidding process. Medford Roofing and Construction won the bid and on September 6t h, 2011 began work on this project. Within six weeks the roof repairs were complete. During the work process, the roofers were professional. The work areas were kept clean. No roofing debris was left on the ground or in the area. Paperwork was turned in on time. None of our tenants have reported any problems with either the roofers or the finished roofs. The finished roofs look amazing. This was absolutely the best experience anyone could have when re-roofing buildings. Christine Ashcraft Executive Director at the Gallaway Housing Authority. I have worked with Medford Roofing and Repair on two construction projects in the Memphis area. The first project was a 3.5 million dollar renovation for Chuck Hutton Chevrolet. 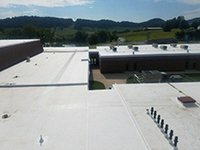 This project involved reroofing six buildings. The job was made even more difficult due to keeping the business open during construction. We also had to do the job in phases which also made it more difficult. Medford Roofing and Repair did a great job on this project and never held the job up. They were always on time and completed their work when it was scheduled and also did a superb job with their quality. Medford Roofing and Repair also helped us out with solving several issues that occurred during construction. All communications with them were very professional and respectful. The second project that I worked with them on was St. Elisabeth's Episcopal Church in Bartlett. This was a shingle job installed over insulated nail deck. This was a very high profile job due to the Gothic design of the church. The main roof of the church was on a 15/12 pitch which made it very difficult to work on. Medford Roofing and Repair again did another quality job for me on this project. They were complete on time and met all expectations. I would highly reccommend Medford Roofing and Repair for any roofing project that you have. If you have any questions about their work feel free to contact me at anytime. Mitch Ballard Superintendent Linkous Construction Co. Inc.